we assume that you have installed required packages and software for angular 5 development. it will create an angular 5 application in the current directory and install some default npm packages. it will open this project in your default web browser from 4200 port. Goto Firebase Console. it will automatically log in with your gmail account. Click On Add Project. it will open a pop-up window, inside that name your project, then click on Add Project button.After creating firebase project, Project Dashboard / Project Overview will be opened like this. 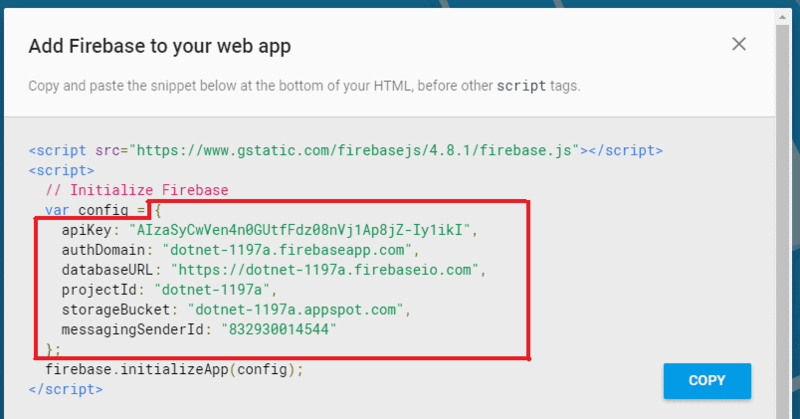 Click on ‘Add Firebase to your web app’, it will open another popup window with firebase project configuration. copy config object from there. then past inside environment.ts file as firebaseConfig. Firebase and Angularfire2 are official packages to interact with firebase project from angular applications. Open appmodule.ts file, then initialize firebase module with firebase project configuration. remaining two components will be child components for this employees component. Open app.module.ts file, Add newly added components into declarations array. We’ll use Bootstrap and Font-Awesome Icons For Application Design. So first of all add CDN reference for the style sheets inside index.html . Add Following to employees.component.html file. We need Model and Services to design remaining child components. To create these classes let’s add a new folder with name shared inside employees folder (/src/app/employees/ ). So let’s add properties corresponding to these employee’s details inside employee.model.ts file. $key is used to store unique key automatically generated by firebase DB when we insert a new record. EmployeeService contains selectedEmployee property of the type employee model class Employee, to store currently active employee details. employeeList variable store all the employee records from Firebase DB. In-order to interact with firebase project we have injected AngularFireDatabase as firebase. getData function initialize employeeList from firebase node ’employees’. we will store employee records under this node. rest of the functions are self explanatory. In-order to list inserted employees we can use employeeList property in employee-list component. So first of all we have to Inject this service class inside child components. Before that we have to discuss our application structure. This our application structure, component employees will be the parent component for employee and employee-list component. We are going to inject EmployeeService inside the Parent Component Employees. and there by we can access the same injected service instance from child components Employee and Employee-List. so whenever we make make changes in one child component same change can be seen from other child component also. To inject a class inside a component , mention the class inside component providers array and then create private parameter inside component constructor. We’ll create an employee form to implement Insert and Update Operation with employee Component. For that, let’s create a Template Driven Form(TDF) using selectedEmployee property from injected EmployeeService Class. So first of all we have to import FormsModule in appmodule.ts file. You can use following html in employee.component.html file. 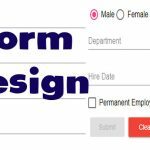 This form is a collection of label – text box pair with Submit and Reset button. We have an extra hidden field to store $key of current employee. Same form is used for Insert and Update Operation. required attribute is set to name text box, so employee name is mandatory to submit this form. 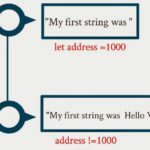 When name text-box is invalid, ng-invalid and ng-dirty classes are added to it. So based on these we have implemented form validation. 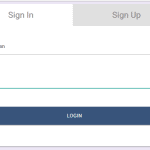 when name is empty, employee form as whole is not valid so we add conditional disable attribute to Submit Button. Inside employee.component.ts file we’ll write code for Insert and Update Operation. Before that I’m going to install ngx-toastr from npm package, this package helps us to show notification message inside angular applications. In-order to install the package, you can use following npm command. then add ToastrModule inside app.module.ts file. Open .angular-cli.json, then update styles array. Now you can add following code inside employee component. 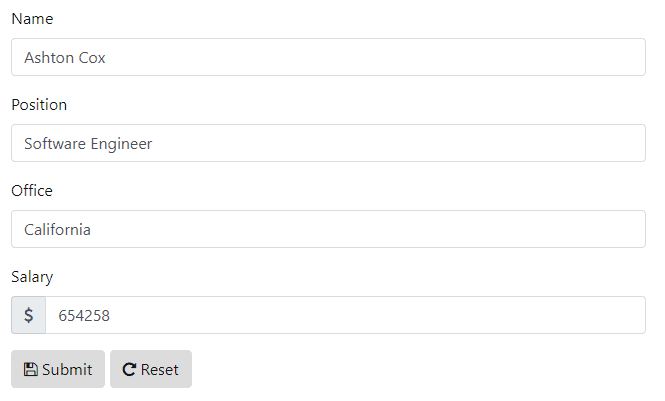 restForm() function is used reset form controls value to initial stage, we called this function from reset button click event and from ngOnint Lifecycle Hook to initialise the form. Inside the form submit event function OnSubmit, we implement both insert and update operation based on $key value. To show the success message, we use ToastrService class object tostr. Using employee-list component, we’ll list all inserted employees and then implement Delete Operation. 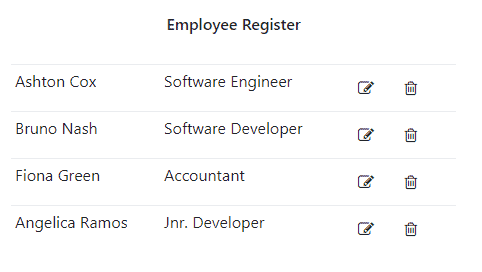 you can add following inside employee-list component. Inside this we have injected EmployeeService and ToastrService Classes. Also we created an Employee array employeeList. Inside the ngOnint Lifecycle Hook, we subscribe to firebase db collection and we store employee records inside an array. Using this array variable, we will display inserted employees inside employee-list component. when we click on pencil button, it will call onEdit() function to populate the corresponding record inside the employee form, after changing user’s details,he can update record as we discussed before(inside employee component).Using trash icon we implemented delete operation with onDelete() function. Thanks for the visit, hope you liked it, let me know your comments. I just followed this tutorial. Everything worked perfectly! Thanks!!! how I get user by Id please, someone ? Thanks for this great tutorial. works perfectly. 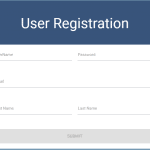 Have a question: I am using angular material for my form and I have used mat-select and mat-option for multiple selection. For editing, how can I show the currently selected options on the form?? you can do ng serve or even ng serve -o !!!!! this example works perfectly.thanks for the information.Can someone help me how to perform queries such as i like to filter the names of the employees whose salary is greater than 5000. Hi, thanks for this, this is great! Are you able to provide a PAGINATION tutorial please? oh and…. posting images to Firebase storage please? when I add following line whole page content not showen.Why? You just saved my life! This is by far the best up to date tutorial. Thank you so much for this!! I admire you guys, it works well!! i appreciate this material on angular 5… in fact it’s my first ever material. But when i store an employee, the toast displays at the left downside with no css as it does in your demo. could u guess why please?! Thanks for the comment, Sorry I forgot to mention toastr style-sheet. Hi great tutorial!!! But, how are data passed in the form when the edit button is pressed? I modified a bit the code to show only the list and after the edit button is pressed to show the form but it is empty. Why do we import the service in employees component ? If I just import the service in employee and employee-list component, It work as well. service class is imported to components employees,employee and employee-list. But only for parent component (employees), we have a providers array for the service. because of that same instance of service is shared in child components(employee and employee-list). So changes made from one child component can be accessed from other component. why, when i’m adding datatable for employee-list showing error after insert update or delete, can you tell me ? great everything worked perfectly thanks a lot…..
Man Awesome tutorial !!! Great job…:)…..I have gone through many sites of Angular 5 CRUD Application, none of them provided this much accurate approach. Glad you found the material helpful. “node_modules appears empty, you may need to run `npm install”. I tried npm install but again same issue. I’m Glad, you found the post helpful. Edit Functionality is not working, the selected values were not retrieving back to form fields.